Exploring the garden after the rain. I wish i could see the world with fresh eyes, look on the smalles things with such deep interest. 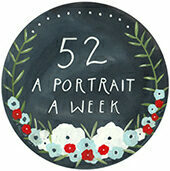 A protrait a week every week for a year.